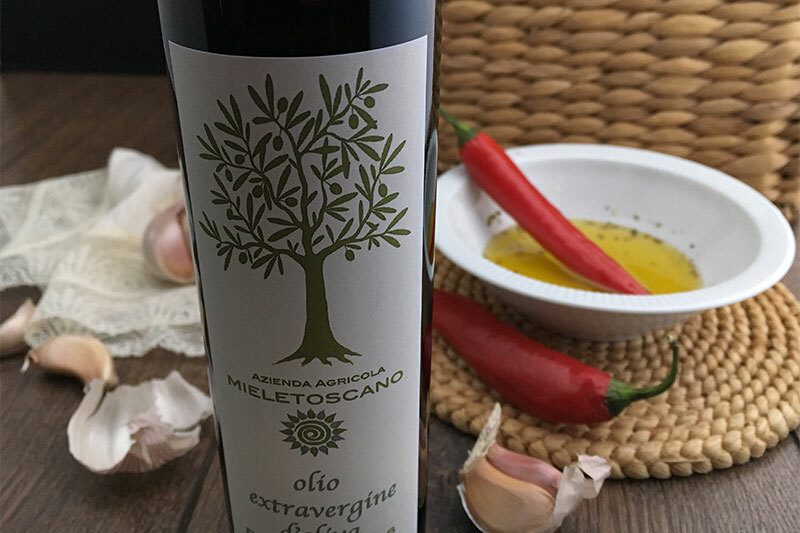 This extra virgin olive oil is made from black Moraiolo, Frantoio and Leccino cultivar olives. From trees which have not been treated chemically for pest or other fruit pathology control in olive groves using organic methods and mechanical traps alone. Olives are picked and selected by hand and pressed at a modern olive press just a short distance away from the grove, using cold pressing of not fully ripe olives picked in October. This technique conserves precious olive pulp residues, giving oil that just off the olive press, simply unique flavour. With a fresh, herby flavour, our extra virgin olive oil is packed with polyphenols and especially good used uncooked. It is a top quality, emerald green olive oil with golden highlights and a fruit flavour with notes of artichokes and just shelled fresh almonds. An emerald green olive oil with golden highlights, delicately fruity with hints of almond and artichoke and a mildly spicy finale. The ideal condiment for salads, marinades, seafood starters, vegetable soups, vegetable mixed fries, fresh cheeses and anything else you feel like trying it with! Formats available: Glass 250 ml bottles or 1 and 3 litre tins.